Quicksilver Geyser is decent, since it's an instant and bounces two cards. 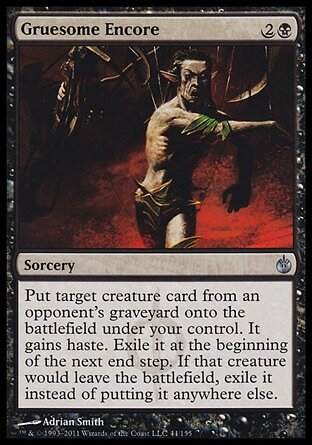 However, if your stack only has room for one card like this, then this is trumped by Resounding Wave (from Shards of Alara). Resounding Wave is hard to counter (cycling it is an ability, not a spell), doesn't count as your spell for the turn (or even an alternate cost spell), bounces two of any kind of permanent, and draws you a card besides. If your stack has room for two double bounce effects, then toss the Geyser in. I'd be willing to argue that the effects don't replace one another as much as the supplement each other. Getting rid of two things is almost always good at instant speed. Just something you might want to try out, Yugi, I know I will be. It's in there now next to Resounding Wave (I temporarily removed Recoil to make room). We'll see how it works when it's been through a few games. It'll probably be stronger in games with only 3 or 4 players compared to a fuller 6 to 8, at least in theory. So far it's been used in one 5 player game where it got rid of a Marit Lage token (take THAT indestructible), and reset someone's Luminarch Ascension, though it had to do so with someone else protecting it in a small counterspell skirmish (showing the difference between this and the Wave). I'll get to try it again in an 8-man this weekend. We'll see if it performs just as well. I'm surprised at no mention of Gruesome Encore! It likely won't make the cut in my stack, which has a very high threshold for additions, thanks to Sorcery speed. However, anyone that is considering Divine Offering-level cards should take note.